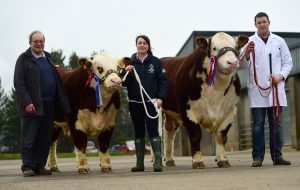 Friday seen the start of the season for Northern Ireland Hereford Association’s Premier Show and Sale sponsored by Danske Bank. With over 28 entries from 13 top breeder’s the first of the association’s events didn’t disappoint the spectator’s and buyers alike. Judge George Workman from Garvagh had the difficult task of picking his Champion and reserve as all bulls presented on the day where of quality and class. His Supreme Champion went to SH Stewart’s Thornbank 1 Might Man. “For a bull of 23 months, he is well grown, correct and showed class when in the ring” stated George. Sired by Solpoll 1 Dynamite from the McMordie herd he certainly has his fathers genes. The 2016 1st prize winner from the National show later went under the hammer and achieved the top price on the day of 4100 guineas. Overall Reserve Champion went to Norman McMordie and family with River-dale 1 Neptune. 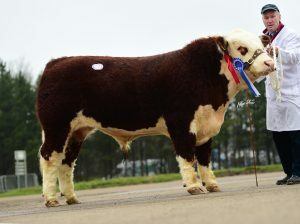 Sired by the prolific Panmure 1 Henry this August 2015 born bull was packed with style and certainly had ring presence. Trade on the day was healthy with a 75% clearance of bulls going under the gavel and an average of £2300. 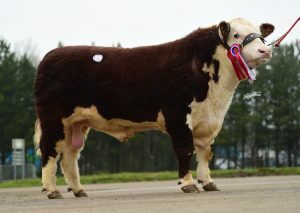 Champion Thornbank 1 Mighty Man was sold for 4100 guineas to the pedigree herd of W McCrabbe, Raphoe, Co Donegal. Dorepoll 1 Lawman bred by JE & RI & W Haire sold for 2500 guineas to O & I Hawe of Knockloughrim. Reserve Champion of Norman McMordie River Dale 1 Neptune was bought by J H Fraser from Belfast for 2300 guineas. D R Wilson’s two bulls, Lisrace Lifeguard 16th went for 2400 guineas to Montgomery Bros of Eglington and Lisrace Liberty 15th for 2200 guineas to James Eakin of Moy.